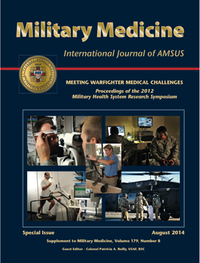 Military Medicine is the Association's official monthly journal. Articles published in the journal are peer-reviewed scientific papers, case reports, and editorials. The journal also publishes letters to the editor. It is currently under the leadership of its Editor William H.J. Haffner, M.D. (CAPT, USPHS, Ret.). AMSUS Membership includes a subscription to the journal available in print and online. The objective of the Journal is to promote awareness of Federal medicine by providing a forum for responsible discussion of common ideas and problems relevant to Federal healthcare. Its mission is: To increase healthcare education by providing scientific and other information to its readers; to facilitate communication; and to offer a prestige publication for members’ writings. The journal began publication in 1892 as The Military Surgeon. Referenced in Index Medicus and on the MEDLARS system, Military Medicine is a valuable educational and informational resource for all Federal Health Professionals.